In the period 1861 to 1918, thirty-three commons were established in Northern Sweden. This was linked to the finalisation of the Great Redistribution of Forest Holdings in Dalarna and the delimitation process in Västerbotten and Norrbotten. They were intended to serve as an instrument for improved and sustained forest production, the viability of farmers and the liveability of the rural communities in the areas where they were established. The aim of this paper is to describe the results of a study examining how three of these forest commons, one from each region, have benefitted the local shareholders and their community. The perceptions among forest common shareholders were assessed using a questionnaire. The study also assessed economic impact on shareholders in terms of extent and use of the dividend from each of the commons for the period 1958-2007, highlighting the extent of the economic support to individual shareholders and to the local community. Results reveal large differences between the three cases; there was a positive correlation between the extent of the economic support and contentment among the shareholders. In the literature, commons are traditionally described as resources where usage rights are shared according to set principles, often covered by legislation, and among a defined group of members; however, due to the subtractability of the resource and the difficulty (or high cost) of exclusion, commons are considered a separate class of goods, different from pure public goods or the club goods (Becker and Ostrom 1995; McKean 1998). Furthermore, studies of common-pool resources in numerous settings, particularly of those that have survived for a long period, have shown that commons can perform as well as or even better than public and private resource management institutions under certain conditions, which have been promulgated as the “design principles” for successful commons (Ostrom 1990; McKean 1992, 1998; Becker and Ostrom 1995). Box 1 lists the attributes associated with the successful common property regimes, which also correspond to the “design principles” (Ostrom 1990; McKean 1998). One of the key characteristics of a successful/successfully-governed common is considered to be the equity or perceived fairness in sharing of the benefits and the costs within its members/shareholders (Ostrom 1990; McKean 1998). In many of these successful commons studied, sharing of the benefits and costs were linked to the size of the shareholding or on the private asset holding of the household (McKean 1992, 1998), as is also the case in the Swedish forest commons (Carlsson 1997). Moreover, as McKean (1998) points out ‘distribution of decision-making rights and use rights to co-owners of the commons need not be egalitarian but must be viewed as “fair” (one in which the ratio of individual benefit to individual cost falls within a range they see as acceptable)’ for a common to be successful. However, previous studies on the Swedish forest commons have not only pointed out the diminishing role of the shareholders in terms of governance/management (i.e. decision-making rights) of their commons (Stenman 2009; Holmgren et al. 2010), but they have also pointed to the fact that the shareholders in Swedish forest commons do not bear costs proportional to the benefits they obtain (Carlsson 1997). In this context, it is therefore relevant to evaluate the outcomes that members perceive, as well as the extent to which commons may contribute to not just their own welfare but that of the people who are not part of the commons, for example, by supporting public goods (cf. Short 2008). For instance, Short notes that common land in the UK has recently come to be “prized for its public good functions, a relatively new concept for commons generally and one with a different economic meaning” (Short 2008, 207). In addition, he notes, “commons are increasingly important to a number of ‘new’ rural objectives and that the associated policy developments may hold an important message for sustainable multifunctional land management more generally” (Short 2008, 193). However, the Swedish concept of Forest Commons (FCs) has largely been institutionalised by the state to provide goods and services not only to FC members but also to the public. FCs in Sweden are thus more akin to community-based enterprises in that they are based on utilitarian economic models but have social goals (cf. Berkes and Davidson-Hunt 2010) and can be compared to the land management by village corporations e.g. in Alaska (Dayo and Kofinas 2010), although the bylaws covering Swedish FC were, in some cases, established more than 150 years ago. The Swedish FC originated from shares in the ownership of private forests, providing a resource managed in common and thereby contributing to social goods rather than representing only individual goods. There are 23.6 million ha of forest in Sweden, of which 50% is owned by some 336 000 non-industrial private forest (NIPF) owners (Anon 2008). Twenty-five thousands of these owners are also shareholders in one of the 33 FCs, established in the period 1861–1918 in the interior of northern Sweden (Holmgren 2006). These FCs cover 537 000 ha of productive forestland of which 410 000 ha belong to NIPF owners. Forest owners hold shares in the commons, and these can only be transferred together with the private estates to which the shareholding is tied. The shareholder rights, including the right to hunt and fish in the FC, are retained even after the shareholder has moved away from the community (Allmänningsutredningen 1983). In each FC, a board elected by the shareholders manage (make decisions regarding) the forests with support from a professional forester. Indeed the FCs are required to employ professional foresters for the actual work, and they execute the agreed actions regarding the forests. Shareholders’ voting rights with respect to management of the FCs are, in general, proportional to the size of their shareholdings, although some FCs have introduced by-laws designed to limit the dominance of the larger landowners. At their establishment, the Swedish FCs were supposed to meet a number of objectives – these, along with the means of achieving them have been discussed by Liljenäs (1977, 1982, 1983), the Ministry of Agriculture (Allmänningsutredningen 1983), Stenman (1983), Kardell (1991, 2004), Carlsson (1995, 1999, 2000, 2001), Ericsson (1997) and Pettersson (2003), among others. A summary of these aims and means is presented in Box 2. No ranking of their importance has been attempted, since the aims are closely interconnected. As shown in Box 1, one reason for establishing the Swedish FCs was to improve the quality of life, through forest-related activities, in the local communities in which they were established. The means to achieve this were by improving the local economy, providing employment, incentives to local agriculture and forestry, and supporting the provision of common goods in the local community (e.g. social care, a priest and a doctor, and bringing electricity to rural areas). The overall intention was to create places where people would like to work and live. Therefore, the interaction between individual (private) benefits to commons’ members and to the wider community is relevant in the Swedish case in particular. Moreover, we expect there to be differences in shareholders’ perceptions of FC contributions, advantages and disadvantages, and that the Swedish FC may illustrate the division between a focus on common and on individual aims both at the shareholders’ level and at the FC level. More specifically, we expect to find shareholders’ perceptions of the benefits linked to the individual benefits they derive from the commons, and as such we expect economically successful FCs to have a more engaged/participatory shareholder base than those not performing as well. This issue has not received much attention in previous studies of the Swedish forest commons. Thus, the main purpose of this study is to assess the extent to which the Swedish FC, like a community-based enterprise, supports shareholders’ private interests and at the same time promotes public goods relevant to the rural society. Furthermore, given the nature of their establishment (top-down), we assess, using the relevant attributes of successful commons (Ostrom 1990; Becker and Ostrom 1995; McKean 1998) and by looking at shareholders’ perceptions as well as actual outcomes in terms of revenues and dividend shared in the past 50 years, whether the FCs in Sweden can be considered successful. The FC in Älvdalen was established in 1885 and the Jokkmokk FC in 1889 (Holmgren 2006). Both of these FCs are composed of a 25% share of each farmer’s originally allocated land, amounting to 54 000 ha of productive forest land in Älvdalen and 61 120 ha in Jokkmokk (Älvdalen FC homepage 2009; Jokkmokk FC homepage 2009). In 1906 the earlier delimitation rules (SFS 1873) were changed in the ‘Act Relating to Establishment of Commons by Coercion’ (SFS 1906, 36). From then, the official view was that the state was the owner of the land to be donated during the delimitation process (Stenman 2009). Hence, the state could by-pass earlier delimitation rules concerning the size of allocated forest land, making it easier to establish an FC without the landowner’s consent. However, the delimitation process was by then almost finished, essentially only the inner regions of Västerbotten remained unallocated. Among the remaining areas were the western half of Stensele parish and the whole of the adjacent Tärna parish. The forest land in Tärna was of insufficient size and of poor quality. It was therefore decided to join the Tärna FC with the more fertile forest land in Stensele parish. The FC established in 1918 was therefore called the Tärna-Stensele FC (TSA) and is composed of 45–50% of the farmers’ allocated land, in total about 38 400 ha (TSA FC homepage 2009). The joining of the two FCs went against the wishes of the shareholders from Stensele (Stenman 2009). Furthermore, the shareholders from Tärna were in the majority and, with the establishment of the TSA, obtained fishing and hunting rights in Stensele parish. In 1971, the two parishes were amalgamated into the municipality of Storuman. TSA is 96% owned by NIPF shareholders, of whom 48% are resident. Since the resident NIPF owners generally have larger shares in the FC, they own about 61% of it. This is also the FC, among the three examined, where the number of shareholders has increased the most, from 449 in 1923 to 1300 in 2008. At the time of its establishment, there were 1199 shareholders in the Älvdalen FC, a number that has today increased by 55% to 1857. The number of shareholders has been higher, but, through a project called “voluntarily exchange of land” (“frivilligt markbyte”), shareholders have been helped by the FC to find solutions to issues concerning multiple and/or unclear ownership, and to exchange land. The aims of the project have been to improve the layout of the land and to increase productivity. According to the shareholder register, 824 (44%) shareholders were resident at the time of our study. The number of shareholders in the Jokkmokk FC is currently 896. The largest owner is the forest company SCA, which is not a NIPF and owns more than 50% of the shares. The municipality of Jokkmokk has experienced a decline in population of 53% over the last 50 years and today about 454 NIPF shareholders (who own 29% of the FC) are resident within the municipality. In total, NIPF shareholders own 45% of the FC. Even though SCA is a majority owner, it only has one representative on the board and its dividend is limited to 25% of the general forest subsidy. This results in a proportionally larger share of the dividend for the NIPF shareholders. The forest commons selected for this study: Älvdalen in Dalarna, Jokkmokk in Norrbotten, and Tärna-Stensele in Västerbotten, are three of the major forest commons in Sweden. The selection was based on their relative similarities (in size and geographical position as foothill forest with relatively low site productivity of about 2.5–3.8 m3/ha/year within their regions) as well as their relative differences (time of establishment, the principles for distribution of the dividend, and the differing share of NIPF-ownership). The government regulates the FCs more strictly than the individually owned and managed NIPFs (Holmgren et al. 2010), although there are regional differences in the level of government involvement. For example, Västerbotten has been considered the most restrictive and Dalarna (previously Kopparberg) the least (ibid). Besides the national legislation, each FC also has its own specific by-laws. These are authorized by the County Administration, which regulates the direct management of the FCs (Carlsson 1995). Another important difference between the regions concerns the stipulations and practices developed in relation to the use and distribution of the dividend (in Swedish, “utdelning”) from the commons. The dividend should here be understood as being the part of the annual profit (before taxation) that is distributed to the shareholders or to common goods. The FCs, in general, practice a supportive subsidy system whereby profits and subsidies are distributed to the shareholders on the basis of investment in and management of the estates connected to the FC shareholding. Here, subsidies are given mainly for local agriculture (e.g. veterinary costs and milking machines) or forestry (e.g. seedlings, management plans), and also to local public bodies (e.g. for roads, schools, sports and cultural activities) (SFS 1952; Carlsson 1995). FCs in the county of Västerbotten have traditionally been allowed to distribute profits as cash payments to shareholders and continue to practice this system. In line with early directives, these payments are proportional to shareholder ownership. There has also been a move towards this system in Norrbotten, in the form of the general forest subsidy (“förstärkt skogsvårdsbidrag”), although this is split equally among shareholders. In both cases, the payments are made to all shareholders regardless of their place of residence (SFS 1952). In terms of socio-demography, all three municipalities are characterized by low population density and out-migration, low educational standard and relatively high rate of employment in forestry and agriculture (Statistics Sweden 2008). As the main focus of this study is on the shareholders’ perceptions regarding the individual and common benefits from their forest commons, this study employed a short questionnaire survey to obtain information on shareholders’ assessments of the contribution of the forest commons to themselves and to their community (common benefits), including monetary contributions. The questionnaire survey sought to elicit actual/stated benefits (and costs) as well as perceived benefits (and costs) at individual and community level from the respondents. Thus, perceptions of support as well as the extent of economic and other benefits and costs are assessed for the three forest commons studied. In addition, we compare the amount of the dividend from each FC, and its distribution, over the last 50 years to add to our analyses of the survey results. The value, distribution and use of the dividends were assessed on the basis of the individual FC management plans and reports for the period 1958–2007. It was not possible to obtain the required figures from these documents for the period 1958–1967 for Jokkmokk. Instead, the data reported here for this period are from Liljenäs (1977). While comparing the economic performance between these three FCs, it is important to note the differences between the three FCs studied on how they spent their revenue, both as subsidies and cash dividend to individual shareholders and on common goods and services. However, considering the large differences between Älvdalen, Jokkmokk, and TSA, we do not believe this minor shortcoming adversely affects the overall picture presented. For the ease of comparison, the values presented in the results are given in terms of 2006 prices. To maintain the local perspective, only resident shareholders in the three FCs were included in the study. The shareholders were divided into three strata based on the size of their individual share in each of the FC: the 25% largest shareholdings, the 50% intermediate, and the 25% smallest shareholdings. Each stratum was further split into female and male shareholders. Thus, shareholders for each common were divided into six strata. The purpose of stratification was to make sure that the number of large shareholders and women would be large enough to perform further analysis of the impact of holding size and gender, however not within the scope of this article. Each group was limited to a sample of 50 individuals, selected by uniform random sampling. As some of the groups turned out to contain fewer than 50 shareholders, every individual belonging to the group was chosen. This was also taken into account in the statistical calculations. In total, 862 questionnaires were sent out in March 2009. After two reminders, 423 questionnaires were returned and the results are thus based on a total response rate of 49%. At the stratum level the response rate varied substantially, from 23% to 65%, and at the FC level from 44% in Jokkmokk to 53% in Älvdalen. The response rate for women was 48% compared to 50% for men. Although the response rate may be considered low, it should be noted that the responses represent 22% of the actual population. The data from the questionnaire survey were first entered, verified and coded on a spreadsheet. In line with the stated research objectives, the shareholder responses regarding various aspects of management and benefits sharing from their FCs were then analysed and, more importantly, compared across the three FCs. We primarily use cross tabulation of the responses (counts) with FCs as the grouping variables to compare shareholders’ responses to various aspects of their participation and perception of benefits and disadvantages from their FCs. The comparison in responses across the FCs and the test of significance (χ2) were done in STATA 11 (StataCorp 2009). About 19–43% stated participation in meetings, with the highest proportion of participants in Jokkmokk and the lowest in TSA, with statistically significant difference between the FCs overall (Table 1). Between 9 and 32% participate in excursions, courses and the like (the most in Älvdalen, the fewest in TSA, with an overall significant difference between the FCs). Utilisation of the FC mainly took the form of hunting, fishing and outdoors activities, however, the proportion of shareholders making use of these services varied significantly between the FCs (Table 1). Pairwise comparisons also showed significant differences between the three FCs for most of the activities/sources of benefits, however, it was clear that Älvdalen and TSA had significantly larger differences than Älvdalen and Jokkmokk, and Jokkmokk and TSA. The economic dividend was either a cash payment or a grant contribution (depending on regulations of the individual FC). The shareholders in Älvdalen (and also to some extent in Jokkmokk) also stated indirect benefits from the support to local sporting and other associations, roads, schools and public meeting rooms. Very few suggested that they have no contact with or benefit from the FC, although a small proportion of uninformed respondents exist (indicating that not all shareholders are aware of benefits from the FC). Overall, these results suggest that most shareholders receive some benefit from the commons, with a smaller portion being active within it, and that the benefits range across the scope of individual to public services. Moreover, it is important to note that participation in and utilisation of services/benefits from the three FCs varied significantly. In terms of shareholders’ perceptions regarding the benefits from their FCs, we see some significant differences between the three FCs, for both individual and common benefits (Tables 2 and 3). A number of perceived individual benefits by the shareholders were actually associated with the public goods, particularly in Älvdalen. The shareholders in that FC reported investment in roads and other local public goods, employment opportunities together with support for management of their own properties as the most important outputs of the FC (Table 2). In Jokkmokk shareholders stated that support for management of their own property and support for hunting, fishing and recreation were the most important benefits from their FC. The latter was also considered most important by TSA shareholders, while no other alternatives were indicated as an advantage by more than 40% from this FC. However, the second most frequently listed advantages of TSA FC membership were income and management of part of the forest property without any requirement for personal involvement. Overall, a significantly larger proportion of respondent shareholders from Älvdalen and Jokkmokk perceived benefits from their FCs in different ways compared to those from the TSA (Table 2). However, very few respondents recognized no advantages at all. These results indicate that public goods are the most important output in Älvdalen, while support for managing individuals’ forest properties is considered important in all three commons, but more so in TSA. With regard to disadvantages perceived to be associated with FC membership, while about 73% of shareholders in Älvdalen perceive no disadvantages, 15% still note that it is difficult to get shareholders to pull in the same direction, 5% that the distance between management and shareholders is too large, and 4% report lack of control of their share as a negative factor. In Jokkmokk, 70% of respondents perceive no disadvantages from the FC, with 12% reporting the difficulty in getting the shareholders to act for a common goal a major disadvantage. TSA respondents, in contrast to the other two FCs, had a rather different view of their FC with 45% reporting difficulties in getting shareholders to act for a common goal as a major disadvantage, followed by 20% citing too little profit from the FC, 16% citing lack of control on their share in the FC, and 15% stating too many shareholders as some of the major disadvantages of their FC. Only 32% of the respondents in TSA perceived no disadvantages from their FC. In addition, 13% of the TSA respondents perceived the rules, laws and by-laws related to their FC as a major disadvantage, while 9% thought there was too large a distance between the shareholders and the manager. To relate these perceived advantages and disadvantages, including potential impacts on individual property, to those perceived regarding general contributions to development in the municipality, resident NIPF shareholders were asked about community-level benefits they associate with their FC. The results are presented in Table 3. The responses indicate several differences between the three FCs (Table 3). The majority of respondents from Älvdalen (64%) and Jokkmokk (57%) associated their FC with contributions to the local economy; the figure was much lower in TSA (38%) – a statistically significant difference between the FCs (Table 3). Of the respondents from Älvdalen, 89% reported that the FC contributed to the roads. The figure is significantly lower for Jokkmokk and TSA at 45% and 31%, respectively. 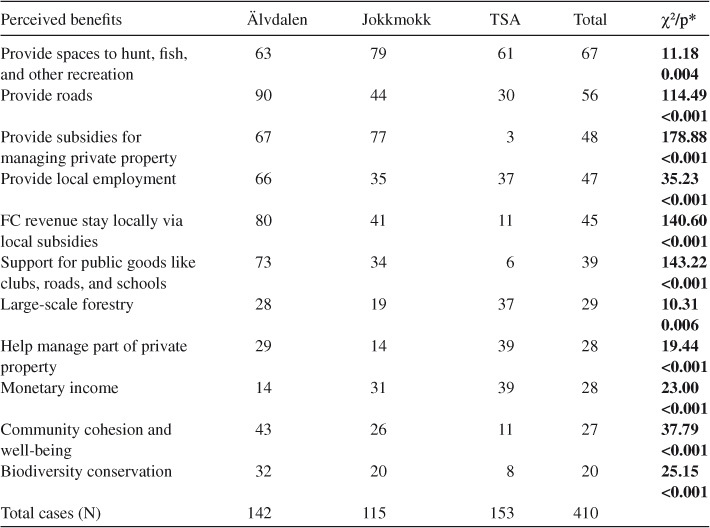 Similarly, significantly larger proportion of shareholders from Älvdalen associated their FC with promoting environmental and cultural values as well as overall well-being locally compared to those from Jokkmokk and TSA (Table 3). Finally, the respondent shareholders were also asked to indicate their opinions on various statements related to their FCs in order to gauge their overall view (Table 4). Corresponding with our findings presented above, the TSA shareholders seemed to have a less positive opinion of their FC since many stated that they found the statements only ‘partly true’ or ‘not true’, or that they did not have any opinion. Generally, the respondents from Älvdalen FC exhibited the highest level of agreement with the statements and respondents from TSA the lowest. Most shareholders in Älvdalen and Jokkmokk (85% and 83%, respectively) fully agreed with the last statement, “I am very content to be an FC shareholder”, compared to only about half of the shareholders in TSA (Table 4). However, only a small number of the TSA shareholders (7%) reject this statement as “not true”. Even for statements related to their individual/personal gains from their FCs, significantly larger proportion of respondent shareholders from Älvdalen and Jokkmokk had favourable response compared to those from the TSA (Table 4). By far the largest dividend per hectare among the three FCs was in Älvdalen FC during the entire period 1958–2007 (Figure 1). Älvdalen FC has three main income-generating streams: forestry, capital investments and hydroelectric energy production. The total amount distributed in Älvdalen increased considerably in the last decade. 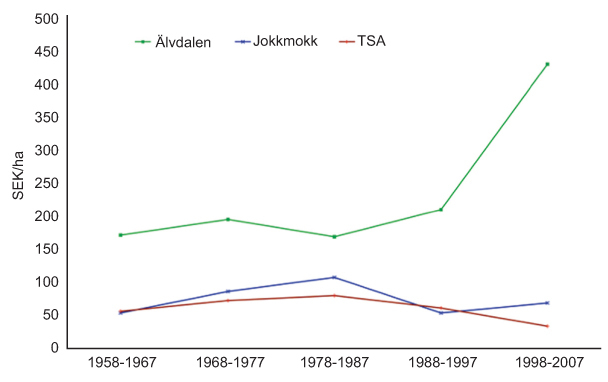 In contrast, the dividend per hectare in Jokkmokk and TSA has stayed more-or-less the same during the same period, with some decline after 1987. The distribution system applied to the Älvdalen FC is such that the entire dividend stays within the municipality, either for common goods or to subsidise expenses incurred on the shareholders’ estates. In total, Älvdalen FC has distributed around 615 million SEK (based on 2006 prices, 1 SEK approx. 0.15 USD) over the last 50 years, of which 226 million SEK was distributed during the most recent decade. This corresponds to a contribution of 5053 SEK/year to common goods from each shareholder. In addition, the FC subsidizes the shareholders for activities on their estates amounting to, annualy on average, 7141 SEK per shareholder. Thus, for the last 10 years the FC has distributed, on average, 12 194 SEK per shareholder annually, corresponding to 430 SEK/ha/year (Figure 1). The second largest dividend was from Jokkmokk FC; during the last 50 years the FC has distributed about 228 million SEK. For the last 10 years, the major shareholder, SCA, has received about 600 000 SEK annually and the NIPF shareholders 1.8 million SEK as general forest subsidy (equivalent to 2020 SEK/NIPF-shareholder/year). In addition, 1.9 million SEK has been distributed annually as subsidies to the NIPF shareholders (2168 SEK/NIPF-shareholder/year). Thus, for the last 10 years the FC has distributed, on average, 4188 SEK per NIPF shareholder per year, which corresponds to 70 SEK/ha/year (Figure 1). Leakage of profits out of the FC occurs mainly through the dividend distributed as general forest subsidy to non-resident shareholders, including all the money distributed to SCA (600 000 SEK/year), and about 50% of the sum distributed to NIPF shareholders as general forest subsidy (900 000 SEK/year), totalling 1.5 million SEK annually. The smallest dividend was from TSA, which during the last 50 years has distributed about 118 million SEK. The dividend for the last decade was the lowest of the whole period, on average, 1.3 million SEK/year. This is equivalent, on average, to 1015 SEK per shareholder per year, and corresponds to 34 SEK/ha/year. The leakage amounts to about 39% of this, i.e. around 0.5 million SEK per year. Despite the fact that the FCs were established in similar ecological and geographical environments, in order to fulfil the same aims, and having been subject to the same legal regulations since 1952, our results reveal that they have developed in different ways. There are differences in both perceptions of the benefits and costs from the FC by its membership, at an individual and at the community level, and in the actual size and use of the dividend. In general, most of the FC shareholders seem to be satisfied with their situation, but there are significant differences in how much advantage is perceived to result from FC membership between Älvdalen, Jokkmokk and TSA; shareholders in the latter seem to be the least satisfied. With regard to perceived benefits, shareholders from Älvdalen reported the highest level of FC support to local public goods while Jokkmokk shareholders emphasised individual gains. This seems to correlate with the priorities in each FC – which may be a result of management, reflecting members’ wishes, or of members having accepted particular types of outcomes of FC membership. In terms of shareholders’ involvement in the management of their FCs, they elected the board responsible for day-to-day management with the professional forest manager and forest workers doing the actual work. However, our results reveal that very few shareholders actually attend the general assembly of the FCs – the figures ranging from about one-fifth to just under half of the respondents. Although lack of participation seems to be the general trend in the Swedish FCs (see for example, Nylund and Ingemarson 2007; Stenman 2009), it is interesting to note that TSA, with least satisfied shareholders as well as lowest dividend, also had the lowest participation rate. Although it is difficult to assess the causal link between participation (or lack thereof) and the level of benefits, we believe it to be dynamic and accentuating one another based on the shareholders’ responses in this FC. For example, almost half of the respondents in TSA cited difficulties in getting shareholders to act for a common goal as a major disadvantage; while about a fifth said lack of control in their own share in the FC and too little profit accruing from the FC as the major disadvantages of their FC. The latter two points may reflect a more state-regulated situation in the county of Västerbotten where TSA is located (cf. Holmgren et al. 2010), compared to Norrbotten and Dalarna. Nevertheless, these negative perceptions among the shareholders are likely to have a significant impact in their level of participation within the FC. On the other hand, although the participation in Älvdalen and Jokkmokk was still only under 50%, it seems to be not related to similar sets of disadvantages as in TSA. With regard to the dividend, Älvdalen FC yields the largest economic returns to the local shareholders, makes the highest contribution to common goods, and has the highest proportion of contented local shareholders. In contrast, the economic contribution is the lowest and the shareholders are the least contented with the TSA FC. Jokkmokk has an intermediate position in terms of both contentment and economic returns to NIPF shareholders. Thus, there is a positive correlation between the extent of economic output to shareholders and contentment. It also seems that the amount of the dividend that is distributed to common goods is correlated to contentment. Partly, the differences in the size of dividend are due to additional income besides that from forestry, particularly from hydroelectric power stations, but also from capital investments. In addition (cf. Holmgren et al. 2004), the FCs in Dalarna generally have a higher mean site productivity and have been more active in their forestry operations. The cited study also found evidence of restrictive forestry practices in FCs in Norrbotten and, particularly, Västerbotten. Furthermore, the shareholders in TSA have been found to undertake fewer forestry activities in their individually managed forests (Holmgren et al. 2007). One feature that differs between the FCs is the proportion owned by NIPFs. Hence, the forest companies may have influenced the intensity of forestry within them. Despite the low dividend and low level of contentment, the number of shareholders has increased the most in TSA and the least in Älvdalen FC. This might seem contradictory, since the economic incentives to be a shareholder in Älvdalen FC are higher than in TSA. However, when the FC dividend, together with the income from private estates, becomes insignificant other ownership values may become more important. Such values could, for instance as data from TSA suggest (Table 2), include recreation, fishing and hunting, which are goods that shareholders gain access to regardless of the size of their share. Indeed, hunting, fishing and other recreational activities were both the stated and perceived primary benefits in all the FCs studied. In contrast, the perceived benefits from extractive forestry activities (for example, timber and fuelwood) were hardly mentioned. One of the major reasons for this is the fact that all forestry activities in the FCs are taken care of by professional foresters. However, this seems to create and widen the gap between the participation (and hence the input/cost) to the commons and the benefits (outputs) that the shareholders accrue from them; as Carlsson (1997) suggests, shareholders in the Swedish FCs seem to receive disproportionately higher benefits than their costs. When we assess the performances of these three FCs in relation to some of the relevant attributes of successful commons (Ostrom 1990; McKean 1998) (see Box 1), we find striking correlation between the economic performance (efficiency), and the perceived fairness (Box 1, #8) and general well-being from the FCs. Only a quarter of respondent shareholders in the TSA totally agreed that their FC contributed to a more fair distribution of resources, while the figure is close to half for Jokkmokk and three-quarters for Älvdalen. When we look at the economic performance of these FCs, Älvdalen provided the highest dividend per hectare and TSA the lowest, with Jokkmokk in between (Figure 1). This was the general trend in all the statements related to the shareholders’ views regarding their FCs (Table 4). Again, it is difficult to say which contributed to what – i.e. economic performance contributed to the shareholders’ views of fairness and well-being (or lack thereof) from the FCs and hence their involvement (or lack of active participation). Or, it could be that the decreasing level of active participation and interest in the management of their FCs, and in formulating the FCs plan of action over the years has contributed to diminishing economic performance, especially in the FCs like TSA. In any case, one of the major attributes of the successful commons seems to be the (perceived) fairness both in the decision-making rights and in the accrual of benefits from the commons. In the case of TSA, we find this not to be the case. In addition, the three FCs may have developed differently to some extent due to their early history and the settings in which the FCs were established. While Älvdalen FC was established in an old cultural setting, TSA was established under coercion and in an area where there has been little (if any) previous experience of traditional commons. Furthermore, the TSA FC was established by uniting the Tärna and Stensele FCs into a single common and by placing it in Stensele and giving the majority ownership to Tärna; it was, thus, created with an inbuilt tension something that has contributed to its less successful performance (cf. Ostrom 1990). The distribution principles applied by Älvdalen FC is such that the entire dividend stays within the municipality, either for common goods or to subsidize expenses incurred on the shareholders’ estates. In the case of TSA, in contrast, there has been the highest proportion of leakage out of the municipality, the smallest dividends, the lowest local contentment, and, it seems, people have lost much of their economic interest in the common. Nevertheless, we find that most Swedish forest commons have the attributes that are considered necessary for successful common property regimes, particularly in terms of their physical and institutional characteristics, such as clearly defined boundaries; membership criteria; and creation, modification and enforcement of rules, among others. Given that these commons have survived for over a century and continue to do so, many of them as successful commercial enterprise, demonstrates that many of the attributes associated with these Swedish FCs are certainly those of ‘long enduring commons’ (Ostrom 1990). To conclude, this study highlights the significant differences in terms of actual economic performance as well as in perceived benefits from the Swedish forest commons that were established on the same institutional and legal framework, and are similar in terms of size, their site productivity and geographic location. We find that the FC with better economic performance also reflected the attributes usually associated with the successful commons, such as the perceived fairness in the distribution of benefits, and providing greater well-being to the individual shareholders as well as the community at large. In contrast, the FC with the worst economic performance was perceived to be less fair in its benefits distribution, and as a source of well being by its own shareholders. The major issue, however, seems to be the lack of active participation in the matters related to the FCs, for example in (annual) general assembly, where most of the management-related issues are discussed and decisions made. On the one hand, shareholders, particularly in less well performing FC, seem to be complaining about the lack of control over their share in the FC (and hence lack of impact in its management), while at the same time they seem to be participating less in meetings where decisions about the FC are made. So, the challenge seems to be in reconciling these contradictory positions of the shareholders – in their perceived fairness (or lack thereof) in benefits sharing and in decision-making within the FC, and in their participation (or more precisely their lack of participation). This is particularly important in the FCs with weak economic performance, such as TSA, where these might accentuate other inherent problems within the FC (for example, perceived lack of coordination among the shareholders), and take the FC to a downward spiral. We gratefully acknowledge the Brattås Foundation for their financial support for this study. Anon. Statistical Yearbook of Forestry 2008. Official statistics of Sweden. Jönköping: Swedish Forest Agency. 2008. Becker, C. D and Ostrom, E (1995). Human Ecology and Resource Sustainability: The Importance of Institutional Diversity. Annual Review of Ecology and Systematics 26: 113–133. Berkes, F and Davidson-Hunt, I. J (2010). Innovating through Commons Use: Community-based Enterprises. International Journal of the Commons 4(1): 1–7. Carlsson, L , . Skogsallmänningarna i Sverige. Luleå: Forskningsrapport Tulea 1995, 22. 1995. Carlsson, L (1997). The Swedish Forest Commons: A Common Property Resource in an Urban, Industrialised Society. Rural Development Forestry Network Paper 20e(Winter 1996/97): 1–13. Carlsson, L (1999). Still Going Strong, Community Forests in Sweden. Forestry 72(1): 11–26. Carlsson, L , . Management of social transformations – MOST Discussion Paper No. 51. Paris: UNESCO. 2001. Keeping away from the Leviathan: the case of the Swedish forest commons. Dayo, D and Kofinas, G (2010). Institutional Innovation in less than Ideal Conditions: Management of Commons by an Alaska Native Village Corporation. International Journal of the Commons 4(1): 142–159. Ericsson, S , . Alla vill beta men ingen vill bränna. Skogshistoria inom Särna-Idre besparingsskog i nordvästra Dalarna Rapporter och Uppsatser No. 8. Umeå: Swedish University of Agricultural Sciences. 1997. Holmgren, E , . Forest Commons in Boreal Sweden – Influences on Forest Condition, Management and the Local Economy. Report 18. Department of Forest Resource Management and Geomatics. Umeå: Swedish University of Agricultural Sciences. 2006. Holmgren, E, Lidestav, G and Kempe, G (2004). Forest Conditions and Management in Swedish Forest Commons. Small-scale Forest Economics Management and Policy 3: 453–468. Holmgren, E, Holmgren, L and Lidestav, G (2007). Comparison of Harvesting and Business Activities of Non-shareholders and Shareholders in a Forest Common in Västerbotten, Sweden. Scandinavian Journal of Forest Research 22: 582–592. Holmgren, E, Keskitalo, E. C. H and Lidestav, G (2010). Swedish Forest Commons – A Matter of Governance?. Forest Policy and Economics 12: 423–431. Kardell, L , ; En skogshistorisk skiss. Lima och Transtrand. In: Pettersson, T. J ed. , editor. Ur två socknars historia. Malung: Malungs kommun. 1991. Kardell, L , . Svenskarna och skogen. Från baggböleri till naturvård. Jönköping: Skogsstyrelsens förlag. 2004. Liljenäs, I , . Allmänningsskogarna i Norrbottens län – deras betydelse för det enskilda jord- och skogsbruket. Umeå: Kungliga skytteanska samfundets handlingar, No. 16. 1977. McKean, M. A (1992). Success on the Commons: A Comparative Examination of Institutions for Common Property Resource Management. Journal of Theoretical Politics 4(3): 247–281. McKean, M. A , ; Common property: What is it, what is it good for, and what makes it work?. In: Gibson, C, McKean, M. A and Ostrom, E eds. , editors. Forest resources and institutions. Rome, Italy: FAO, 1998. p. 23.-47. Nylund, J.-E and Ingemarson, F , . Forest tenure in Sweden – a historical perspective, Report No. 5. Uppsala: The Swedish University of Agricultural Sciences, Department of Forest Products. 2007. Pettersson, R , . Ett reformverk under omprövning, Skifteslagstiftningens förändringar under första hälften av 1800-talet. Stockholm: Kungl. Skogs- och Lantbruksakademien, Skogs- och lantbrukshistoriska meddelanden nr 27. 2003. SFS [Swedish Code of Statutes]. Stadgan om avvittring i Västerbottens och Norrbottens läns lappmarker, SFS 1873:26 [Act Relating to Delimitation of land in Västerbotten and Norrbotten]. Stockholm: Government of Sweden. 1873. SFS [Swedish Code of Statutes]. Kunglig Maj:ts nådiga kungörelse angående Tvångsavsättning av allmänningar, SFS 1906:36 [Act Relating to establishment of commons by coersion]. Stockholm: Government of Sweden. SFS [Swedish Code of Statutes]. Lag om Allmänningsskogar i Norrland och Dalarna, SFS 1952:167 [Act Relating to Collectively-Owned Forest Lands]. Stockholm: Government of Sweden. 1952. StataCorp. Stata Statistical Software: Release 11. College Station, TX: StataCorp LP. 2009. Stenman, L , . Avvittringen I Västerbottens läns lappmark. Uppsala: Forskningsrapporter från Kulturgeografiska institutionen, no. 83. Uppsala universitet. 1983. Stenman, L , . Skogsallmänningar i Västerbottens län. Karlstad: Forskningsrapport Karlstad University Studies 2009:16. 2009. Jokkmokk FC homepage. http://www.allmanningen.se/ (accessed September 2009). TSA FC homepage. http://www.allmskog-ac.nu/ (accessed September 2009). Älvdalen FC homepage. http://www.besparingen.com (accessed September 2009). Statistics Sweden (SCB) Kommunfakta 2008, www.scb.se/Kommunfakta (accessed September 2009). Average dividend per year per hectare in the Älvdalen, Jokkmokk and Tärna-Stensele (TSA) FCs during the five 10-year periods between 1958 and 2007, converted to 2006 prices. 1SEK= 0.15 USD. Sources: Forest management reports and annual reports provided by each FC for the period 1958–2007, except Jokkmokk in the period 1958–1967, for which the source was Liljenäs (1977).